Route 66 in Grants, New Mexico by Kathy Weiser-Alexander. 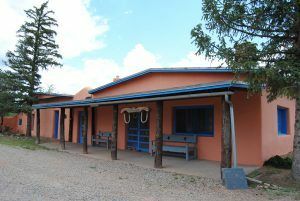 New Mexico’s ribbon of the Mother Road provides the Route 66 traveler with a variety of landscapes, from beautiful mountain ranges to sandstone mesas, desert sagebrush, ponderosa pines and ghost towns. 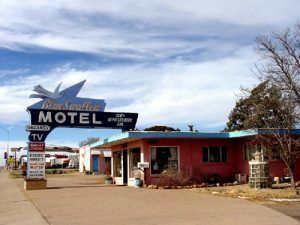 Along the vintage pavement in the Land of Enchantment, you will also see ancient pueblo cities, both open and abandoned motels, lots of neon signs, and an eclectic mix of ancient and contemporary cultures. Dating back thousands of years, you are sure to enjoy the rich history, beginning with the Native Americans, continuing through the Wild West days, into the era of the Mother Road, and beyond. There are two alignments through New Mexico, as in 1937, it was shortened and straightened out, reducing the mileage from 506 to 399 miles. Enjoy your journey through the Land of Enchantment. Blue Swallow Motel, Tucumcari, New Mexico. By Kathy Weiser-Alexander. Click for more from our Tucumcari Photo Print Gallery. 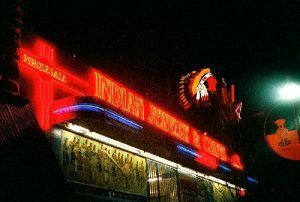 Indian Jewelry Neon Sign Albuquerque, New Mexico. Photo by Robert Garcia. Click for our entire Albuquerque Photo Print Gallery. 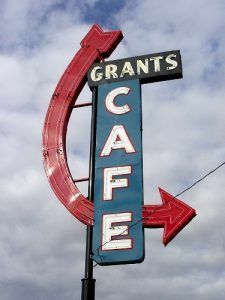 Grants, New Mexico Cafe Sign. Click for prints, downloads and products. © Kathy Weiser-Alexander, updated March 2019.